Half of the world’s population has limited or zero direct access to paved roads and building costly roads, rail links or even airports to access remote locations only serves to leave permanent scars on wilderness areas. Both traditional and hybrid airships can operate without these infrastructure constraints. Hybrid airships have almost limitless applications for moving people and materials to the most inaccessible locations. Hybrid airships bring cost savings in the hundreds of millions of dollars on a single project in airport, road and rail construction costs especially for oil and gas exploration and mining in increasingly remote locations. For wind farm construction sites and solar energy farms, hybrid airships can safely and cost effectively deliver wind turbine parts, including the heavy equipment required to install them. This enables sites currently considered too isolated to be possible sites for future development. Hybrid airships can affordably move fresh produce and other products such as fuel, oil and fresh water to remote communities and bring products from those communities to major markets, improving local economies and acting as a catalyst for wealth creation. With their ‘straight line’ ability and range, Hybrid airships will move cargo from point A straight to point D eliminating the time and expense of double/triple intermodal handling at points B and C along the way. Hybrid airships also outperform heavy lift helicopters with their limited lift, range and high operating costs. When earthquakes, floods, tsunamis or other natural disasters decimate large areas, closing roads, airports, taking out power and communications, hybrid airships offer a unique new vehicle for first responders and subsequent relief services. As well as providing effective medevac transportation, hybrid airships can be configured to act as ‘flying hospitals’ with their own power and surgical facilities. 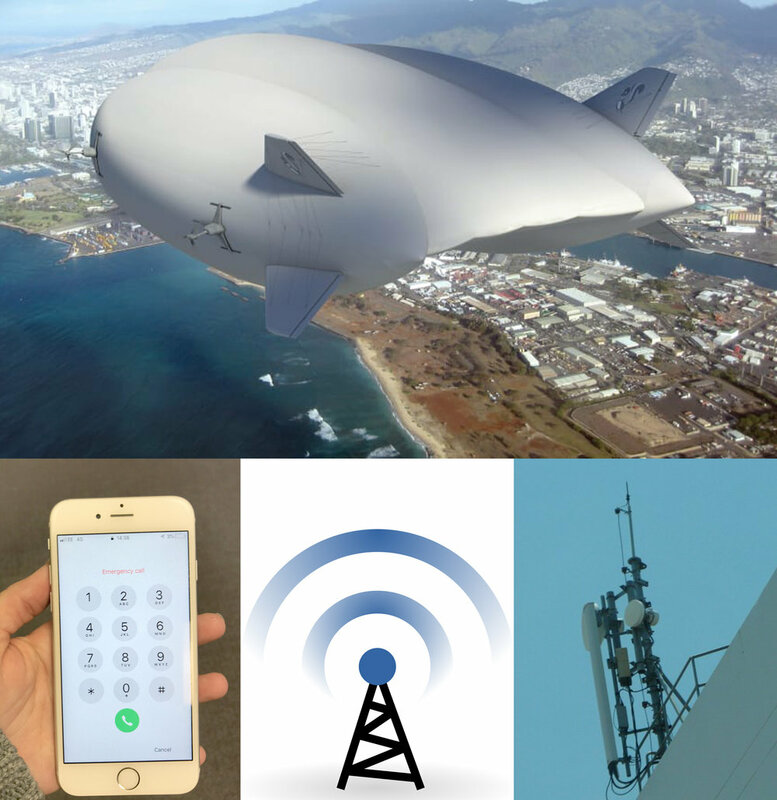 Hybrid airships make excellent stable telecommunications platforms to quickly restore Wi-Fi and cellular network communications in devastated areas. The hybrid airships can also act as an effective forward command post coordinating relief efforts. Without the need for airports or rail and roads, hybrid airships can rapidly deliver rescue teams, generators, vehicles, heavy plant and equipment, food and water and all manner of emergency supplies while evacuating the wounded and homeless on the outbound journey. The failure of communication networks is a common occurrence during many disaster scenarios, and yet we have continued to see this preventable sequence of events play out time after time with deadly, expensive, and potentially preventable consequences. In the immediate hours and days following a disaster, the top priority for emergency responders is to prevent any further loss of life, and if possible, mitigate damage to property and public infrastructure. During this time, it is critical that rescue workers and government officials coordinate their efforts and locate victims who may be injured or trapped, but relief efforts can be paralyzed or severely delayed if the responding agencies are unable to communicate with one another. Hybrid airships are able to established telecommunications quickly, even in areas where regular infrastructure has been devastated, by using a wireless transport device atop a mobile platform (the hybrid airship). The hybrid airship simply manoeuvres into the area and can begin transmitting much faster than the time it takes to repair or replace existing network infrastructure equipment. Hybrid airships will provide critical phone service to rescue and recovery workers when the area’s cellular networks would otherwise been completely cut off, and allowed the responders to organize their efforts and focus on the areas requiring them the most. Hybrid airships are uniquely qualified as search and rescue vehicles having the ability to reach remote locations including oceanic search areas much faster than ships. Once on site, hybrid airships can operate at low speeds and their hover capability along with the ability to remain aloft for extended periods, makes them a uniquely capable and economically viable alternative to other search and rescue vehicles. Once damage has been assessed and survivors are located from the air, hybrid airships can land on most surfaces and if necessary dispatch ancillary vehicles to recover people and instigate clean up procedures. 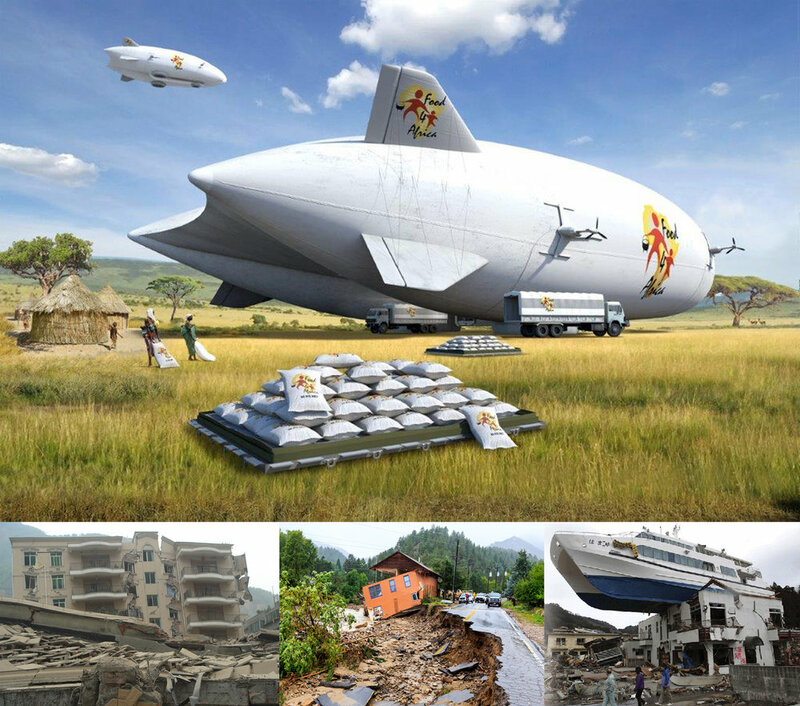 The hybrid airship can access remote areas where no infrastructure exists and / or areas decimated by natural disaster. This gives First Responders the ability to respond within hours of a disaster. The hybrid airship can also facilitate rapid delivery of supplies, rescue equipment and generators, mobile hospital, Medivac, clean water and food, workers and rescue teams, monitoring of areas and evacuation of affected populations. For many of the same reasons that hybrid airships offer a myriad of disruptive solutions to the cargo arena, in all-passenger configurations they also open up a range of exciting new opportunities in the passenger transport and tourism sectors. Hybrid airships can offer low-fare short-haul (100–200 mile) scheduled commercial passenger services between locations that do not have passenger air services, or where people want to avoid major airports. With the ability to take off and land on multiple surfaces, hybrid airships can operate from city centre, lake side and beach side locations avoiding time-consuming commutes on congested roads to get to airports and other transport hubs. Hybrid airships are also perfect for low altitude, low speed sightseeing flights over iconic attractions such as The Grand Canyon, safari parks, the Pyramids, The Great Wall of China, The Great Barrier Reef, the Arctic, Antarctic and many more. Configured like small luxury cruise ships, guests are able to go on longer tour programs that offer a truly unique airborne perspective of the world by visiting unique and otherwise inaccessible locations such as the Himalayas in absolute luxury and comfort. The ‘Advertising Blimps’ of this world simply can’t compare with the sheer immensity and transit speed of hybrid airships. 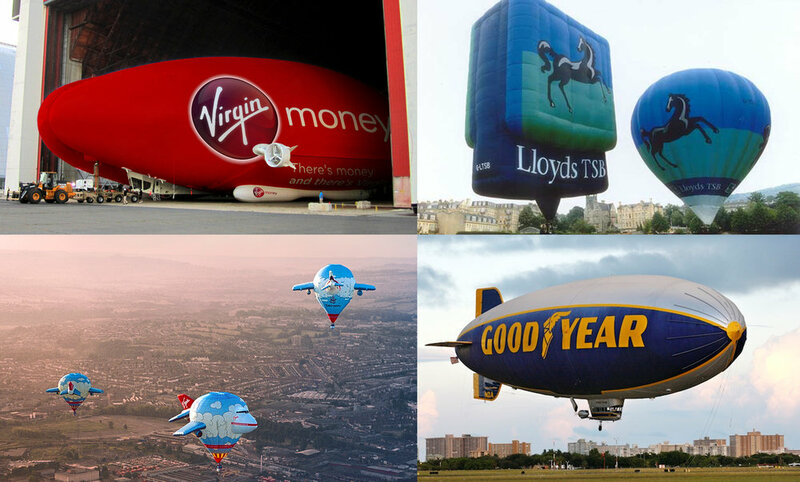 Depending on the end-user, hybrid airships can act as huge, high impact, flying billboards promoting brand awareness and/or earning ancillary revenue to offset operating costs. While hybrid airships can be used as the worlds largest flying billboards and conduct specific promotional programs, cargo carrying clients can get ‘added promotional value’ operating on their daily schedule. For more information on advertising please click…. Hybrid airships can be used as a surveillance aircraft or for border patrol purposes because it provides a stable mobile multi-sensor platform capable of long duration flight (1400Nm between needing to refueling), uses less fuel compared to other aircrafts and produces less noise. Some of the national border guard agencies around the world also perform coast guard / rescue service duties and as mentioned above the hybrid airships can be used as a launch platform for ancillary vehicles. 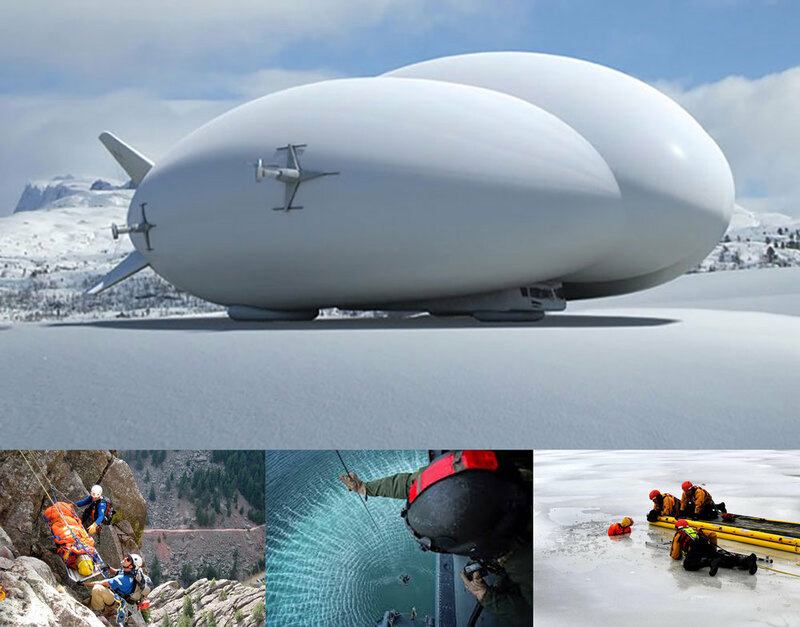 The hybrid airship can be used for intelligence gathering, airspace surveillance, observation and fishery protection. Mobile command and control centres are not only used in law-enforcement and military applications. They can also be used by organizations that require high quality, mobile video surveillance. The hybrid airship will allow a user to monitor and respond to a crisis, as close to the flashpoint as is safely possible. It can quickly and easily locate itself close to the identified surveillance areas, thus optimizing ability of the user to react to the situation. It is an easily deployable surveillance solution that can address a variety of situational requirements: public events (sports, political), demonstrations, and tactical security operations. The hybrid airship can be equipped with a variety of sensors, monitoring stations, command and control application, and remote transmission capability. Intelligence, surveillance, and reconnaissance, (ISR) is a broad category of activities designed to support intelligence development, planning, and decision-making. The goal of ISR is to answer critical intelligence requirements and other information requirements to enable timely and effective decision-making. Hybrid airships are able to provide innovative aerial surveys and services for a variety of sectors. These include aerial surveys for catchment management, coastal and bathing water surveys, mapping of private sewer networks, buried pipes, the identification of disconnected domestic wastewater pipes and the management team at Straightline Aviation have previous experience in the detection, identification and removal of landmines using it’s cutting edge airborne detection technology - MIR™. The aerial surveys for the construction industry include innovative techniques for monitoring and measuring stockpiles, as well as the ability to produce 3D virtual fly-through of projects. We are also able to arrange surveys of building energy efficiency, monitoring of thermal outfalls, oil spill and surveys of pipeline and cable routes, roads, rivers, canals and railways. Additionally, the capability to produce high definition 3 dimensional images that offer an insight into subtle topographical features is available; this cost effective product offers organisations with an interest in land development, mineral extraction and transport planning a level of surface information suitable to underpin strategic decisions regarding land utilisation and access. Ground Penetrating Synthetic Aperture Radar (GPSAR) has significantly improved, and the techniques for location identification, such as GPS, land mass mapping (e.g. Google Earth), and data analysis techniques using dedicated graphic processing chips have also leaped forward so the concept can now be turned into a full solution. Although initially the outputs will require some human interpretation, development is now underway to allow data processing to be immediate and fully automated. This can also be integrated with video / photographic data and GPS data so that the output will be a human readable map, using HD images, showing clearly the location of suspected unexploded ordnance in relation to visual, thermal and infra-red features as well as precise GPS co-ordinates.